What is wrong with the shoulder? The labrum is a specialized type of cartilage that acts like an “O-ring” or gasket on the socket side (glenoid) of the shoulder. A portion of the labrum is torn in your shoulder. Sometimes, what appears as a minor injury causes the labrum to give way. On occasion, a single (acute) injury will cause the problem. Is the labrum always reparable? In the majority of cases, labral repair is possible. About 5% of the time this is not possible. In this situation, the removal of inflammation and scar tissue helps to diminish the pain. Rarely will the condition improve without surgery when the labrum tears. Most often, the pain increases and the movement and strength decrease. Fortunately, this occurs slowly over the years. What is the purpose of the surgery? 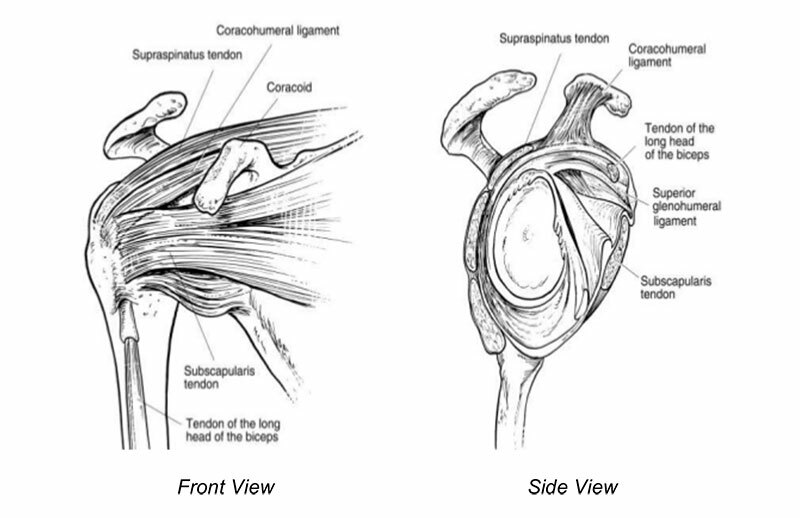 Surgery is performed to suture the torn labrum back to the glenoid bone (labral repair). Sometimes, the biceps tendon is also damaged and needs repair (called a tenodesis). If you're wondering if it's time for you to get surgery, contact Dr. Gombera, today to schedule an appointment. The surgery is done using arthroscopic techniques. Instead of a large incision I use 3-5 small (about 1/2") incisions. Through 1 incision I insert the arthroscope that lets me look inside your shoulder. The other incisions are used to insert special instruments that allow the removal of scar tissue and bone. I then insert small suture anchors into the shoulder. There are sutures attached to the eyelets of the anchors. We use special instruments to weave the sutures through the torn labrum. The anchors are inside the bone and you cannot feel them. They do not have to be removed. The anchors will not set off airport sensors. It is also safe to have a MRI. When you arrive at Texas Orthopedic Hospital a nurse will have you sign the Operative Permit. The name of the operation I will be doing is “Shoulder arthroscopy, labral repair.” If you need additional procedures for your shoulder, these will be added to the permit. Are any other options available? While I believe that surgery is the best course of action, there are other available treatments including no treatment, just living with the condition; physical therapy exercises; medication or injections. Any of these treatment options may be successful in your situation, and some of these you may have already tried. In my experience they will not work reliably. Of course, we can arrange for any or all of these options if you desire. What about stem cell treatments? Stem cells are used in regenerative medicine to repair diseased or damaged tissues. While stem cell or PRP injections may not heal your tear on their own, there is emerging evidence that it can be used to augment and strengthen your surgical repair. These treatments can be done during your surgery. Unfortunately, they are currently not covered by insurance. Please contact us if you would like more information or would like to include this with your surgery. We use general anesthesia because we cannot do this type of surgery with local anesthesia. General anesthesia is currently the only reliable method that allows us to work deep inside your shoulder. In addition, you may receive a nerve block. The anesthesiologist will numb up the shoulder before surgery. This lasts 12-24 hours, and helps decrease pain after surgery. Typically, the block wears after the night after the surgery. You may find it best to “stay ahead” of the pain levels before the block wears off. What will you feel when you wake up? Following surgery, you will awaken in the recovery room with your arm in a sling. Nothing can eliminate the pain completely. Medication, the sling and rest will control it so that you will be as comfortable as possible. Is ice or heat helpful after surgery? Ice is recommended instead of heat. An ice pack should be applied to the shoulder (not directly on the skin) for at least 20 minutes, three times a day. The use of a cold therapy device (e.g. PolarCare) device helps decrease pain and swelling after surgery. The use of the device may or may not be covered by the particular health insurance plan you have selected. You should check with your insurance company. It is optional to use. A coldtherapy device can also be purchased for you to own. Please contact us if you have questions about this. How long will you stay in the hospital? Patients enter the hospital in the morning, have the surgery and go home the same day. This is called Outpatient surgery. Will you need to wear a brace? A sling is all that you will use. Patients wear the sling for 4 to 6 weeks but remove it for bathing and dressing. Use of the sling is important to maximize labrum healing. The length of time to wear the sling largely depends on the size of the tear seen during surgery. Shoulder surgery is a complex and delicate process designed to repair damaged structures deep within the human body. Complications can occur. Fortunately, these are rare. The most common complication involves the bone screws (suture anchors), which occurs in less than 1% of patients. I use these small plastic implants to reattach the torn labrum. There is always a possibility that I would have to remove them surgically if they loosen or cause irritation. Infection can require oral antibiotics, antibiotics by injection and rarely surgery. Wound problems including swelling, bleeding, delayed healing, unsightly or painful scar. Bone infection or fracture could very rarely occur. Joint problems including stiffness or arthritis could occur. Failure to achieve the desired result is not strictly a complication but it can be a source of disappointment. This operation may result in incomplete motion, strength or function. Nerve injury is extremely rare but may result in temporary or permanent, partial or complete loss of feeling and/or movement in the arm. My purpose in listing the types of complications that could possibly occur is to inform, not frighten you. While it would be preferable if we could perform surgery without any risk, this is not the case. The complications are rare (less than 1%) but regrettably, in spite of our best efforts, they do occur. I feel it is your right to know. This type of surgery is successful about 85- 95% of the time. No shoulder operation is 100% successful in every individual but the procedures we perform are reliable and will help restore the potential function in your shoulder. The operation is most successful at relieving pain, restoring stability and improving function. Whether you can return to your previous level is an individual matter and depends on the damage to your shoulder, how well it heals, how well you rehabilitate and how strenuous is your desired level of work or sports. Because of the many variables involved, I can make no guarantees other than to assure you I will deliver the very best medical care possible. When can you return to routine activities? You will be able to use your fingers, wrist and elbow immediately after surgery. You may walk with assistance as soon as you have recovered sufficiently from anesthesia. If you live alone it may be helpful to have someone stay with you for 1-2 days. You may shower or bathe with regular soap and water 48 hours after surgery. Bend from the waist and let your operated arm move away from your side; then use your good arm to wash under your armpit. Some patients find it helpful to put a plastic stool or chair in the shower for a day or two. Remember that you are doing everything with one hand. You may walk outdoors, write, cook, and drive a car (automatic shift) within a few days. Connecting the seat belt is awkward. Take your time and move slowly. Do not lift more than 1-2 pounds with your operated arm. When can you return to work? For most office jobs, I recommend taking a week off work. This will allow you to devote time to your therapy exercises. Some people are able to return to work sooner. When you return to work your arm will be in a sling (for 4 to 6 weeks after surgery), but you should be able to manage as long as you do no lifting, pushing, pulling or carrying with the operated arm. Instructions in the proper use of your arm will be given to you before you leave the hospital. You may begin light duty work involving no lifting, pushing, pulling or carrying, within ten days after surgery. Return to heavy lifting or overhead use may require 3 to 4 months. There are no fixed rules for return to work. What I have described above are reasonable guidelines that I hope will help you and your employer ease your return to the workplace. Full recovery takes about 6 to 9 months. How is the shoulder rehabilitated? The recovery after rotator cuff surgery is complicated, and requires a delicate balance between allowing the shoulder to heal without letting it get too stiff. I have designed recovery protocols based on the latest medical literature and adapted to your tear. There are certain restrictions to be mindful of, and phases of therapy outlined in the protocol. Because of the complexity of the recovery, I recommend you work with a physical therapist. Typically, physical therapy will start the first week or two after surgery. The first part of rehabilitation labral repair involves letting the labrum heal to the bone. At surgery, we put the labrum back in position against the bone. It is not healed. It requires about 6 to 8 weeks to heal to the bone. During that time the less stress you put across the shoulder, the more likely it is for the labrum to heal. You will be allowed to move the arm gently with assistance. This is called passive motion, where the other arm or someone else helps move the operative arm. Vigorous early therapy and active movement of the arm has resulted in many labrums not healing and re-tearing. During this time period the shoulder will become stiff. This is normal and to be expected. The stiffness will go away in time just like a scar on the skin from surgery goes away with time. Once the labrum (or skin) is healed, the body removes the excessive scar tissue. Too much stretching is not helpful, it may be harmful. There are some individuals who form too much scar tissue or the scar tissue is too strong. This happens about 1-2% of the time. For those patients, a small arthroscopic surgery may be necessary 6-9 months after the rotator cuff repair. The above are guidelines. I will adjust your individual rehabilitation based on the severity of the labrum tear and your progress at each office visit. Most of our patients feel more comfortable sleeping in an upright position and many use a “Lazy-Boy” type recliner. You may purchase one at most furniture stores but if you want to use the chair for 1-2 months after surgery you might consider rental. When do you return to the office? Your first office visit is 10 to 14 days after surgery so that I can examine the surgical incision and review the arthroscopic photos with you. Based on the severity of the labral tear, I will give you additional instructions for your recovery. Six weeks after surgery we will advance your activities. Office visits then occur at 4 months, 6 months, and 1 year after surgery. Additional office visits may be required. There is no charge for office visits the first 90 days after surgery. At each visit I will evaluate your progress and instruct you on the next step in your recovery. The successful outcome of your surgery is dependent on a constant process of evaluation that occurs at the office visit. This is not the type of surgery that I can just perform and achieve a success without your help. A successful result requires that patient, surgeon and therapist work together. Regular office visits are a critical part of your care. Your pain medication prescription will be given to you the day of surgery. Because of Texas laws and regulations, a written copy must be given as we cannot call in narcotic pain medication. Chantel will call in an antiinflammatory to your local pharmacy before the surgery. Please take your pain medication as directed. That means that you may take the pills every 3-4 hours as needed. Take the medicine with food in your stomach. Taking the medicine on an empty stomach can cause nausea. You do not have to take the pills if simple rest, arm repositioning or the ice pack controls the pain. Since you (or your employer) have chosen an insurance carrier with particular benefits and because insurance coverage is a complicated business with no fixed rules, please check with your insurance carrier in regard to the specifics of your proposed shoulder surgery. Also note that the hospital bill is not something that I can control, so please direct any questions regarding the specifics of the hospital, x-ray, laboratory and anesthesia bill to the hospital billing office. Arthroscopic operations such as this are complex and require a trained surgical team. I work with another fully trained assistant or physician who assists me during the operation. You may receive a bill for his or her services. Why all the questions about your health? Although the operation involves your shoulder, your entire body will react to the anesthesia and surgery. Your general medical condition is obviously important. Before surgery you must see the anesthesiologist. They will go over your medical condition and request any tests (blood tests or EKGs) or consultations with other physicians if necessary. What should you do before surgery to prepare? It is a good idea to practice doing some activities with one hand. Imagine that your operated arm is in a sling. Practice getting dressed, going to the bathroom, combing your hair, using a hair dryer and driving a car. Can you get out of the car, close the door and get a parking ticket with your arm in a sling? What if you have more questions? We encourage you to return to the office for a further discussion at any time. We will do our best to answer any questions by phone as well. We have a lot of information on our website, www.gomberamd.com. There are surgical animations on the website as well. I perform surgery on Mondays and Fridays at Texas Orthopedic Hospital. How do you schedule surgery?